I’ve been getting so many compliments on my nails that I thought it would be fun to share how I did this look. It’s simple to do, all you need is 2 colors of nail polish, a thin brush, and some nail stickers (not necessary). Just follow these easy steps. Paint your thumb, middle finger and pinky the dark pink color – 2 coats. 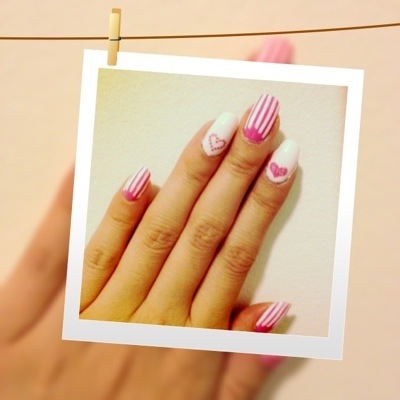 Paint your index and ring finger a pale pink color – 2 coats as well. Find a thin brush – a thin paint brush from an art store will do, or a thin nail brush, dip it in the light pink color and draw vertical lines on your thumb, index and pinky. I like to start by drawing the first line right in the middle of you nail and then work outwards. Tip: if you have shaky hands, try resting your painting hand on a slightly higher surface such as a book. This will give you more leverage and more control while your trying to paint a straight line. make sure to check out my Yes Missy Etsy Shop as well!